Hi crafters, Julia A. here! Today's my first post as a member of the TAWS Design Team and I hope my card will make you smile: I used the Monster Mash stamp set, an oldie but goodie, and enhanced it just a bit. I've made a video for you showing how you can add interest to your stamped images with simple shapes that everyone can draw. Check it out below or on Youtube. Hi Alley Way Friends!! Meredith here with a watercolored creating using two of the newest TAWS sets Cha, Cha, Cha and Neener Neener! 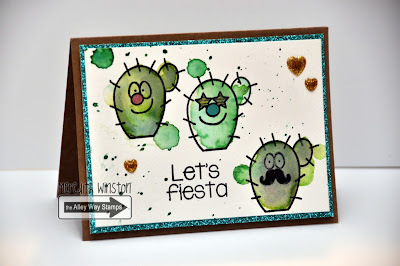 I had the best time using my Kurtake watercolors to adorn these adorable cactus!! Adding their little faces made me giggle! I let it dry and then splatter painted the card panel and added a few sparkly hearts for texture and shine! 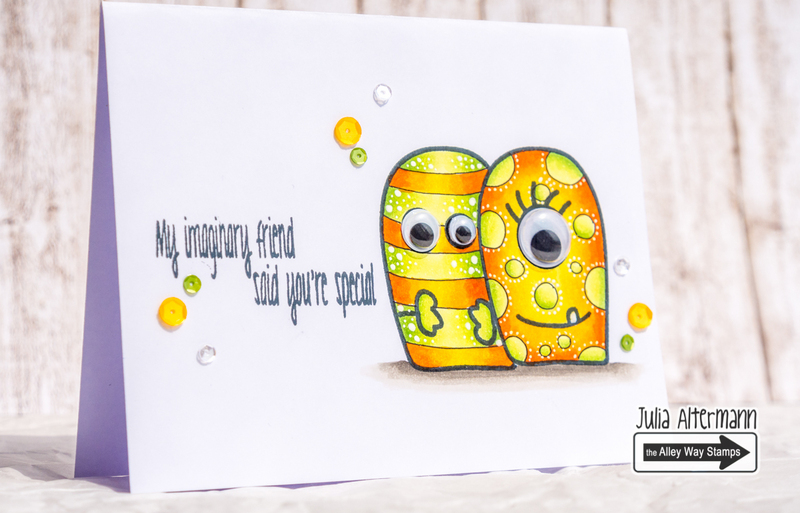 Congrats to you, Julia, on this fresh, fabulous, fun card! Your bright, vibrant striped and spotted googly-eyed monsters are adorable! As for your video...awesome! You share the 'how to' at a pace that's easy to follow...we could craft right alongside you! Meredith, your little cactus-dudes are darling! Totally enjoyable post! Congrats on becoming the TAWS YouTube expert! I love your fun and whimsical colored card!